Set of 4 hardcover Ernest Hemingway Book-of-the-month classics: "A Moveable Feast," "For Whom the Bell Tolls," "A Farewell to Arms," and "The Sun Also Rises"
The sun also rises. Illustrated by Stan Hunter. THE SUN ALSO RISES. Limited Edition. A Volume in The 100 (One Hundred) Greatest Masterpieces of American Literature Series. The Sun Also Rises (Fiesta). Fiesta [The Sun Also Rises]. The Sun Also Rises first appeared in 1926, and yet it's as fresh and clean and fine as it ever was, maybe finer. Hemingway's famously plain declarative sentences linger in the mind like poetry: "Brett was damned good-looking. She wore a slipover jersey sweater and a tweed skirt, and her hair was brushed back like a boy's. She started all that." His cast of thirtysomething dissolute expatriates--Brett and her drunken fianc�, Mike Campbell, the unhappy Princeton Jewish boxer Robert Cohn, the sardonic novelist Bill Gorton--are as familiar as the "cool crowd" we all once knew. No wonder this quintessential lost-generation novel has inspired several generations of imitators, in style as well as lifestyle. Jake Barnes, Hemingway's narrator with a mysterious war wound that has left him sexually incapable, is the heart and soul of the book. Brett, the beautiful, doomed English woman he adores, provides the glamour of natural chic and sexual unattainability. Alcohol and post-World War I anomie fuel the plot: weary of drinking and dancing in Paris caf�s, the expatriate gang decamps for the Spanish town of Pamplona for the "wonderful nightmare" of a week-long fiesta. Brett, with fianc� and ex-lover Cohn in tow, breaks hearts all around until she falls, briefly, for the handsome teenage bullfighter Pedro Romero. "My God! he's a lovely boy," she tells Jake. "And how I would love to see him get into those clothes. He must use a shoe-horn." Whereupon the party disbands. 10/3/2015 Joshua Mark said: A book I first read when I was 20 which changes as one reads it through the years but still delivers a fascinating experience. I am trying to integrate more classics into my reading schedule, because the classics make up the foundation that the books we love today are built upon. Yes, I know some classics are not the most exciting of things to read compared to the Divergent trilogy, but classics hold so much hidden meaning it's mind-blowing at times. I love those types of books where they make you work a bit to realize the meaning of the title or the meaning of a symbol. If you have not read any Hemingway before let me just tell you that he isn't an action packed writer. He focuses on more of the straightforward details whether than all the other frivolous detailing. There's quite a bit of dialogue in The Sun Also Rises, but it's right to the point. The pacing of the story did pick up when the dialogue spanned several pages, otherwise the pacing was pretty slow. 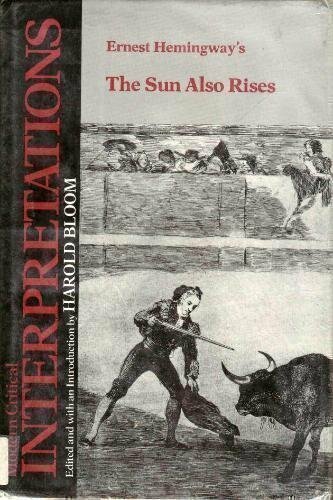 My favorite part of the whole novel was when the bullfights began. Hemingway clearly had a passion for bullfighting or did his research, because Jake's, the narrator, passion had me all excited for the bullfights. Hemingway included terminology for the bullfights, and described the energy and festivities the fans created. The reader finally sees Jake come alive when he and his friends arrive at the bullfights. Before, the readers watched Jake mindlessly go from bar to bar wasting money and making small talk with those he considered friends. The bullfights brought out a passion of Jake's, and made him more relax now that he was not in the repetitious schedule of his daily life back at home. I would recommend The Sun Also Rises by Ernest Hemingway simply due to the fact that it is a classic. I think we all get boggled down with the new releases and books of today that we forget about those who set the foundation. Classics make you think a little bit harder due to hidden meanings interlaced throughout, but the satisfaction upon completing a classic is amazing.